the newest, coolest kid in town. 2. For those who want to avoid crowded areas, the hotel has only 7 spacious rooms on the 2nd Floor of the building. 3. There is an enclosed parking area available a 2 minute walk from the hotel. Our staff can assist you on this and help you with your luggages. 4. We DO NOT offer Food & Beverages, although there are cafes and restaurants close by as AB Fernandez is a busy avenue. Our staff can also assist you if you want food delivered. 5. Dagupan City is 4hrs away from Manila, 2hrs away from Baguio, 1.5hrs away from La Union, and 40min away from Manaoag. 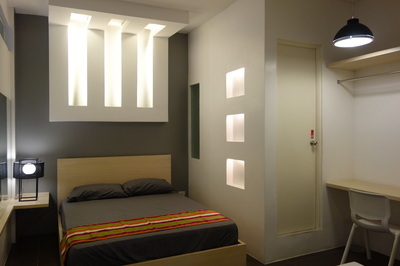 Please email us at reservations.hotelmonde@gmail.com for Room Rates. Hotel Monde interiors are inspired by art and design. 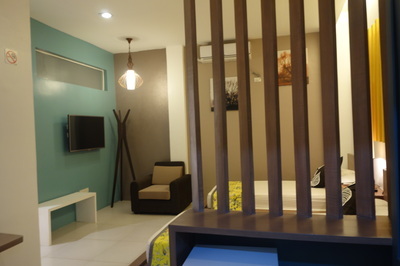 The budget boutique has 7 well designed rooms that are meant for those who prioritize comfort, cleanliness and style.